You are currently browsing the tag archive for the ‘barbed wire and wildlife’ tag. 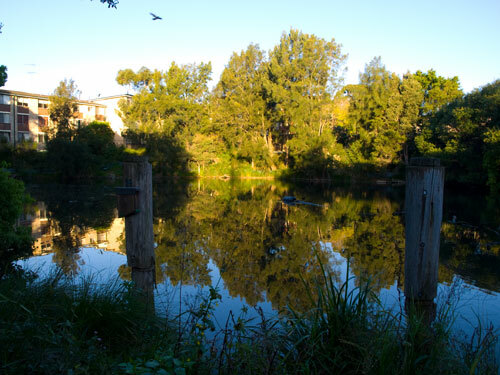 Dibble Avenue Waterhole – a biodiversity hotspot & thankfully, returned to being one of Marrickville’s really beautiful historic places. There is a microbat box on the pier on the left. 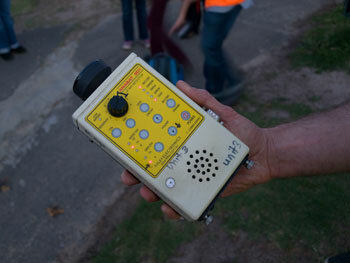 On the 18th September 2013 I went on a Microbat Walk organised by Marrickville Council. Around 22 people met at AB Croft Playground next to the Dibble Avenue Waterhole. Council’s Biodiversity Officer & Ecologist & bat specialist Narawan Williams from Newcastle were our guides. Kudos to Marrickville Council for the work they have done on the AB Croft Playground. There are new trees, new park benches, tastefully displayed sandstone boulders in amongst mulch in the areas that tend to become boggy & a very nice new set of playground equipment. The fence that separates the park from the waterhole used to be topped with barbed wire. That’s gone thank goodness & has been replaced with a high & stylish fence that is secure & unobtrusive, yet allows the public a great view of the waterhole. I wish all the organizations & companies that are stringing up barbed & razor wire around Marrickville municipality used this kind of fencing. If they saw the intense suffering barbed & razor wire cause wildlife, they might think differently, especially if they were the person assigned the job of removing the poor, still alive animal, bat or bird with horrific injuries. It’s a cheap solution that makes our area ugly. We do not live in a war zone. Council removed the old rotted pier from the Dibble Avenue Waterhole, but left the pier stumps, so now the waterbirds have nice places to perch. One pier has a microbat attached. They also re-vegetated the banks, removing bamboo, weeds & unsuitable trees. The whole place looks remarkably different than it did 2-years ago. Council’s work has improved the waterhole & surrounds immensely, which is great for both biodiversity & the community. To my delight we were taken through a private housing complex to a gate on the far side of the AB Croft Playground, which gave us an entirely different view of the waterhole. 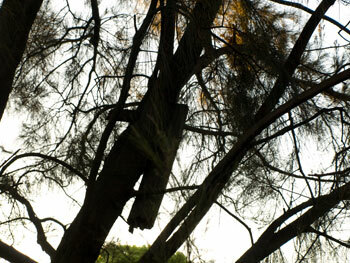 Here we saw four man-made microbat boxes that Council has installed in the trees. We also learnt about which species of microbat has been monitored at the waterhole, as well as information about them. People asked lots of interesting questions. I can’t remember it all & unfortunately I didn’t think to take pen & paper to take notes. The Eastern Bentwing bat, classified as vulnerable, has been spotted in Marrickville. So have two other species of microbat. Unfortunately, I can’t remember their names. Sydney has about 20 species of microbats, about half of which are threatened. Then we headed off to the Marrickville Golf Course & were shown two hand-held microbat monitors that record their ultrasonic calls & GPS location. Microbats are mostly inaudible & the rest are hard for humans to hear. These monitors pick up the sound pulses of microbats, identify the species by the different pulse & of course, identify whether they are in the area. The monitors were handed to participants & then we went off for a walk in the dark across the golf course listening for the little microbats. It was really lovely to be on the golf course at night with lights in the distance & a one-day-off full moon to light the way. 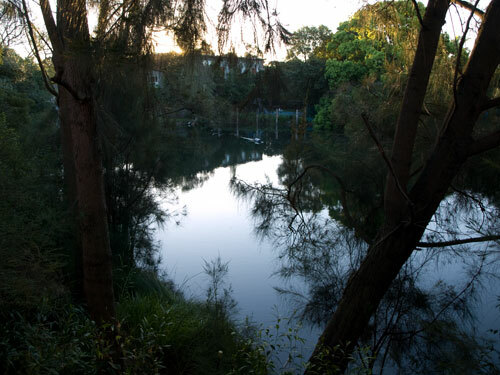 Waterbirds sang from the mangroves & the larger flying foxes from Wolli Creek flew overhead. I’m not sure whether any microbats were detected, but it was so nice, it really didn’t matter – at least to me. We then walked to the wooden bridge over the Cooks River located near the Marrickville Golf Club. Underneath the bridge is another microbat box, as they like to sleep under bridges. This bridge is about to be replaced as Council feels that it is at the end of its lifespan & costs more money to maintain than replace. A new bridge will be built a few metres away. The bulk of the old bridge will be removed, but Council will be leaving the poles for the waterbirds to sit on. I am very happy about this, as waterbirds have almost nothing to sit on in the river. These poles will allow the waterbirds to behave naturally. Besides, the poles will be a visible link to our past. The walk continued through the golf course to the second event, a talk on microbats by Narawan Williams the microbat specialist who came with us on the walk. I did not attend the talk, as places were limited. I am positive that it would have been very interesting. I thoroughly enjoyed the walk & learning about Council’s work to improve habitat for microbats. Marrickville Council says they are likely to do this event again soon, so I recommend grabbing a place next time this event is on. I think you will enjoy yourself & come away with a better appreciation of these little creatures, plus have the lovely experience of walking alongside the river on grass at night. It was a nature fix for me. Thank you to Marrickville Council’s Biodiversity Officer & to Narawan. The event was a total success in my eyes. Microbats are mammals, warm blooded & feed their babies milk. They can be as small as a moth or as big as a human hand. They can make a home in almost any crevice. They like tree hollows, under lifted bark, caves, under bridges & in the walls or roofs of buildings. Microbats are insect eaters & as such, are extremely useful to humans, as are all bats. A microbat can eat as 40% of their body weight every night. Electric insect zappers not only kill useful insects, they kill the food microbats need to survive. Microbats hibernate in winter. Disturbing them during hibernation causes them to return to operating temperature. This uses up precious fat reserves & results in their death. Microbats can see, but use echolocation – the projection of sound at frequencies outside the human hearing range – to find food. They listen to their call bouncing off trees, rocks & buildings. They fly fast & low, changing direction often when chasing their prey. Babies are born in spring & summer. By 8-weeks they are fully developed & can fly & feed with the adults. The Dibble Avenue Waterhole from the other side, closed to the public. You can see the AB Croft Playground & piers opposite. Until organisations like Railcorp & Marrickville Council remove barbed wire from their fencing, interested people can do something simple that will go a long way to helping birds & bats avoid injury. A length of white ribbon or other white material tied at 1.5 – 2 metre intervals along the top strand of barbed wire will make this area visible to birds & they will fly above the barbed wire. The top strand is important as 86% of wildlife entangled on barbed wire is caught on the top strand & white is the colour that is most easily visible at night. The material should be long enough to be able to move in the wind. A 25 cm length tied will allow a drop of around 12 cms (5 inches), enough to be able to flutter, but not so much to be a visible eyesore. This is a simple & cheap way of preventing injury to wildlife. !!! Anyone who wants to do this needs to be careful not to injure themselves whist attaching the ribbon to the fence. A pair of leather gardening gloves will help avoid injury as will long sleeves & a careful approach. !!! And stay away from razor wire! The Wildlife Friendly Fencing Project is also calling for the banning of sales of monofilament (thin nylon type) netting & all black netting across Australia. Their website has photographs of animals caught in this type of netting & the injuries are horrendous. Bats & birds that get caught in this type of netting suffer a long, slow & agonising death for want of a simple change of netting & doing the job properly. Bird & bat-friendly netting is readily available & all one has to do is ensure that the netting is tight around the tree so that it has a bounce-effect. This will allow wildlife to walk over the netting without getting entangled & without being able to get to your fruit. If the flying-foxes do get dispersed from Sydney’s Botanic Gardens, we will likely have an increase in bats in our suburbs & more care needs to be applied to not expose them to unnecessary dangers. Earlier this week I watched a program on Channel 6 about a flying fox rehabilitation centre. Unfortunately, I did not catch their name. As with most programs on Channel 6, this was a simple documentary, the camera fixed on a woman who spoke about the work of the rehab centre with shots of the bats she was talking about. The scene was a large aviary where flying foxes of all ages were being rehabilitated for release back into the wild. A few bats had been so badly injured that they will remain at the rehab centre for life & are used as educational bats when speaking to groups. They can’t fly. 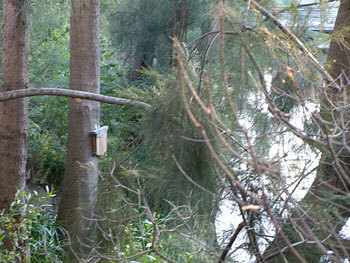 One of these bats was at the Eco Festival on the Cooks River last year. Flying foxes are playful, cheeky creatures that enjoy interacting with humans when in care. They have close friendships with each other. Two bats that were tagged with consecutive numbers before release found themselves coming back into care a couple of years later showing that they had remained together since their release. Staff members have come to work to find an injured bat waiting outside the aviary. Checking their tags they found the bats, for there have been a few, knew where to come if they were injured. Now that is smart. Bats are not just flying around indiscriminately with a few thousand others. They are families, pairs & groups of friends who sleep together & forage for food together during the night. What made me decide to write a post about this program was that the woman being interviewed said there were 2 main reasons why flying foxes get injured. 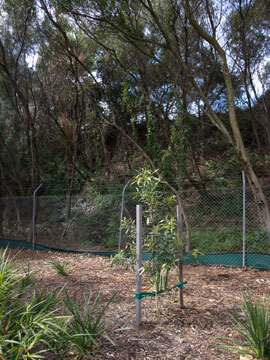 The first is barbed wire, which is often placed near a Eucalyptus or Bottle Brush tree. The bats come to feed on the flower nectar, don’t see the barbed wire & tear their wings. Many bats are still alive when you see them tangled in barbed wire. They stay still because they are in pain. People who see them think they are dead & the bat ends up suffering a long, slow & painful death. So if you see a flying fox in this condition, it is well worth ringing a wildlife rescue organization that will remove the bat if it is dead & rescue it if it is still alive. Barbed wire injuries often mean that a bat cannot fly again & many are so badly injured that they need to be euthanized. How I hate barbed wire & razor wire. I’ve seen more of the stuff in Sydenham seeming to protect something belonging to Railcorp. 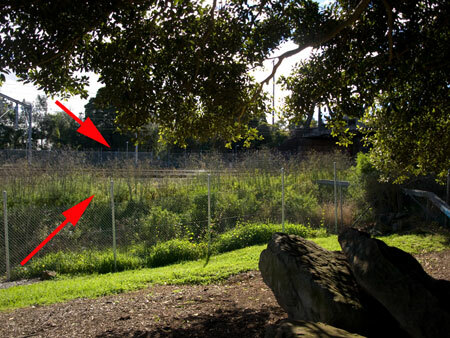 The back fence at Tillman Reserve & the border of the goods line is barbed wire as well. Tillman Park & this section of Railcorp land is viewed as a prime biodiversity corridor so hopefully Marrickville Council will convince Railcorp to remove the barbed wire in these areas. It’s crazy to plant to increase biodiversity & then surround the area with an invisible obstacle course that that has the high potential of severely injuring the very wildlife you are encouraging. 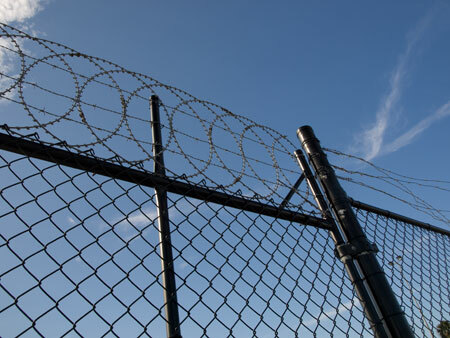 People know how to get through or over barbed wire & razor wire anyway so it is entirely unnecessary. Even the Department of Corrective Services is removing barbed wire from the prison walls & is using slip-rollers instead. If the prisons can remove barbed & razor wire, surely the Council, Railcorp & other organizations around the locality can do the same. How long before a kid gets hurt? 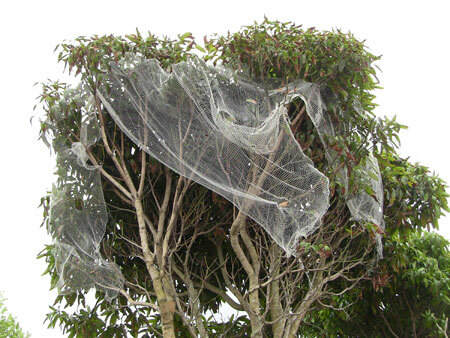 The second main cause of injury is fruit tree netting because people sling the net loosely over the tree. Loose netting means that bats as well as birds are very likely to become entangled in the net. Netting causes deep wounds & severe burns to the skin of a bat. A tangled, trapped bat or a bird is also very difficult to get out of the netting. A homeowner does not want to find a terrified & injured bat wrapped in netting high up in a fruit tree because trying to remove a wild animal is likely to cause injury to the person. It is best to call a trained wildlife rescuer who has also been vaccinated against any bat-related viruses. Outside Sydney contact your local wildlife organization. Your local Vet will also know whom to contact.